First class drapery has its own list of benefits and aesthetic advantages. But when drapes are compared side to side with Roman shades it becomes clear there are certain areas in which this ancient window covering has the upper hand. Below we’re going to outline 6 of them. Ease of use – The Romans were famous for their engineering prowess, creating roads, bridges and buildings that are still in use today after 2,000 years. It’s small wonder then that they’d also create a window shade that is both beautiful and incredibly easy to use. A simple flip of the cord allows anyone to raise or lower them and gives you more effective control over the amount of light you let into your space then you’ll get with drapes. Simple luxury – While drapes can be stunningly beautiful this type of shade approaches beauty from a different angle. It boasts a clean, efficient profile that also embodies and embraces luxury in the materials and textures used to create it. It has the efficient look of the best practical technology and yet it also whispers elegance and style. The old saying “Fashions go in and out of style but style is always in fashion” goes a long way toward explaining the enduring appeal of Roman shades. Effective privacy control – As the world becomes more crowded and personal space becomes harder and harder to find it’s crucial that the home is able to provide a sense of privacy when you want it. While closing the drapes completely can take time and effort, the Roman shade is a fast, effective means for asserting your privacy that looks just as good from the outside when it’s closed as it does from the inside, where you are free to be yourself away from prying eyes. Greater energy efficiency – Drapes are great at preventing expensive heat from seeping out through the window panes but you couldn’t say they offer any sort of nuanced control over your interior environment. They’re really more of a blunt instrument than a subtle method of temperature regulation. The Roman shade by comparison allows you to let in as much or as little light as you want or to close it completely and hold in the heat the ways drapes do. In the end you wind up with a more stable environment in your home and reduced energy bills. Timeless appeal – While no one is suggesting drapes have become or will become dated the fact that the basic Roman shade has changed so little over the centuries endows them with a certain timelessness other window treatments just can’t compete with. And that’s true whether your home is a minimalist concrete masterpiece or a classic Victorian. Seasonal applicability – This type of shade will help you maintain a warm, comfortable environment in your Toronto home through the bone-chilling days of January and February by letting you control the amount of radiant heat you allow in and effectively trapping heat that’s already in your space. In the summertime too there’s no need to remove them or switch to something lighter. That’s because you can hang them down in front of your open window in July and they’ll allow air to enter the room around them while at the same time retaining your privacy and helping to filter out noise from the street. The Roman Shade is one of the few remnants of the ancient world still in common use today. It’s survived from the days of Caesar due to its incredible versatility, practicality and applicability. 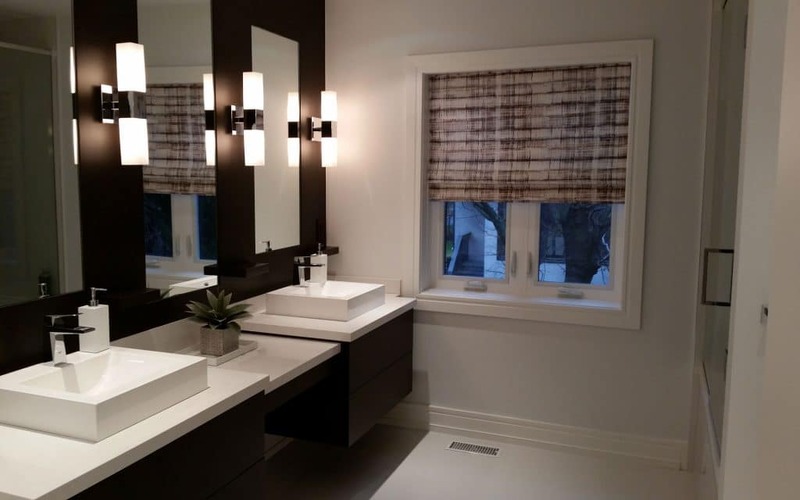 Today homeowners and businesses across Toronto use Roman Shades as an alternative to drapery and as a way to help reduce their energy consumption, maintain privacy in an increasingly intrusive world and add a simple timeless dimension to their decoration efforts. If you’d like to learn more about this incredibly flexible window treatment call Sarit Arnesty on 647-898-4073 and talk with one of our window treatment experts. We’ll be happy to discuss possibilities with you as well as answer any questions or concerns you might have about installing Roman (or any other type of) shades in your home or office.